Now here is something you don't see very often. 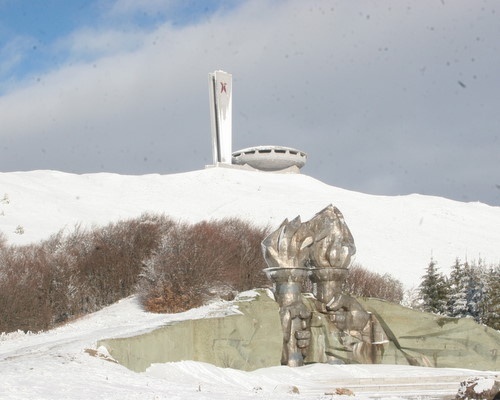 On top of Mount Buzludzha there resides a concrete, UFO-like structure. It was there that in 1891 the foundations of the Socialist Movement in Bulgaria were laid. The monument erected at the site and unveiled in 1981 on the occasion of the 1300th anniversary of the founding of the Bulgarian state is actually shaped as a UFO; why is another question altogether, but it has a 70 meter concrete pillar next to it. Buried in the ground beneath the monument is a capsule containing a message for the future. However, as it was a vestige of the communist regime the monument has sunk into oblivion and has fallen prey to graffiti and anti-communist slogans. Actually I have to say it is simply awe inspiring in construction terms and the view from beside the structures is one of the most beautiful in Bulgaria. And minstrels sing their songs about him....."
Now you will want to get some idea of how to get there. Well first of all, head for the famous Shipka pass in Central Bulgaria. At the top of the pass there is the well known Shipka monument. When you get to its base instead of staying on the road to Kazanluk, swing a left into the National Park. Continue along this road, keeping the UFO on your left and with a bit of luck you will arrive in two purpose built car parks. Then if you are like me, you start climbing the footpath. This should not be attempted by the feint hearted. Once you reach the top completely knackered and gasping for oxygen, you will discover that a perfectly serviceable unmarked road meanders up the other side of the bl**dy mountain.